I'm new to this forum, so hopefully I haven't mis-posted here. I'm looking for old Russell's guides and their map supplements, from basically any era. I recently spent a fascinating day at the NY Public Library looking through their collection of old guides. I've never been much of a timetable collector, but I'm very interested in starting. Also, if anyone has any memorabilia available from the Reading, PA local buses (BARTA), I might be interested in that as well. ...W E L C O M E.....A B O A R D... this figurative C T S FIVE STAR LUXURY SERVICE we have been running here! any issued and operated, U S Highway Authority ever! I've seen bits and pieces of that website come up during Google searches, but I've never started at the homepage to dive in. Thanks for the link! I'll second H.H. 's motion by adding my welcome to you and we look forward to your valuable input and contributions. Because of the association that Reading Bus Company of Reading, Pa. had with my alma mater Green Bus Lines (NY), I have compiled quite a bit of information about the company that may be seen through the various threads of this site. Just to give you a sample, I have attached a photo one of many Reading TDH 4507's that originally came from GBL. Mr. Linsky - yes, I've seen that and many of the old photos on here...I believe there was an introduction thread that spiraled into trading old Reading Bus Co. photos. Very interesting to see the old buses and to match them to landmarks in the Reading area. Also on the "photos" section of this site there is a very interesting one from, I believe, the early '70s, taken in front of a neighborhood diner in Reading. The place is still there and does a brisk business...in fact, Obama visited there during a swing through Pennsylvania for his campaign. I missed him by only 10 minutes! I had gone there for breakfast and left right before the G-men came by to scope the place. Recently BARTA #8901 was put up for bid. I was considering bidding a token amount on it just for the fun of it...turns out not one bid was placed, so my token amount likely would have won me a nice Orion I! But still interested in any old Russell's guides, if anyone has stockpiled any extras. I'm not sure what they have as far as collector value, but I'd be happy to pay any reasonable amount to get my collection started. Linsky -- tell the truth now, was that pictured TDH 4507 an ex-Indianapolis Transit unit? 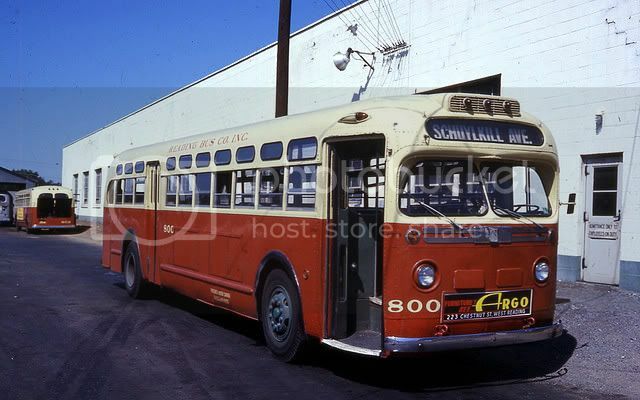 Those are the exact colors and lettering style, right down to the bus line owner above the window line as Indianapolis old-look buses of the sixties and seventies prior to public ownership. I know I have a photo at home... have to dig it out and scan it for comparison.